Any other points with permission of the Chair. AJAY THIARA / Secretary Old Cottonians Association India. This entry was posted in Events, News, Post and tagged 2016, AGM, Meeting, OCA India on October 17, 2016 by admin. As you may know, OCA Nepal was officially established few months ago. We are now trying to grow by collecting funds for our association as well as doing something for the school. 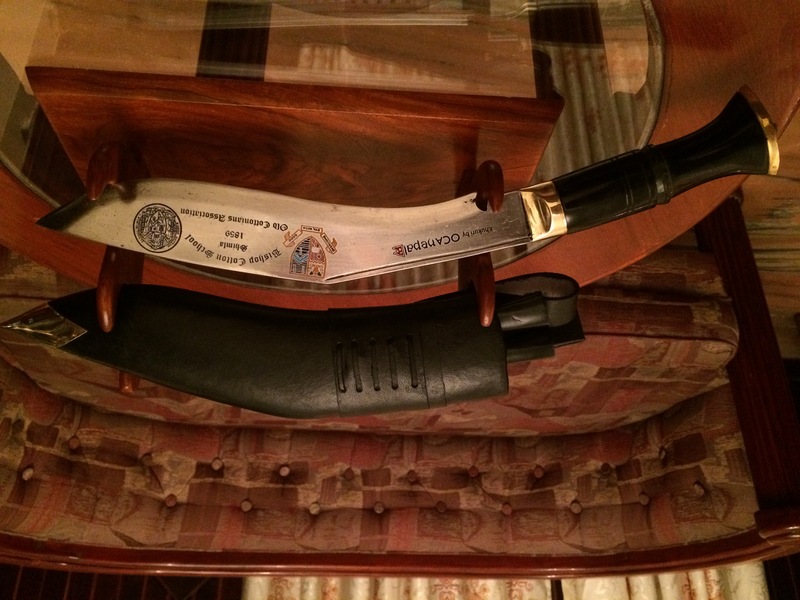 Therefore, we created a souvenir, which will be for sale during the school fete [UPDATE: Venue for showcasing, sales and ordering of Khukuri, an OCA Nepal merchandise, has been moved to: Marina Hotel, OCA Dinner, 8:00 p.m., 30 September 2016. If the Khukuris run out, please place your orders through Mr. Ajay Thiara, Secretary, OCA.] this OC Week 2016, that signifies Cottonian-ness as well as Nepali-ness. Please do have a look and spread the word. 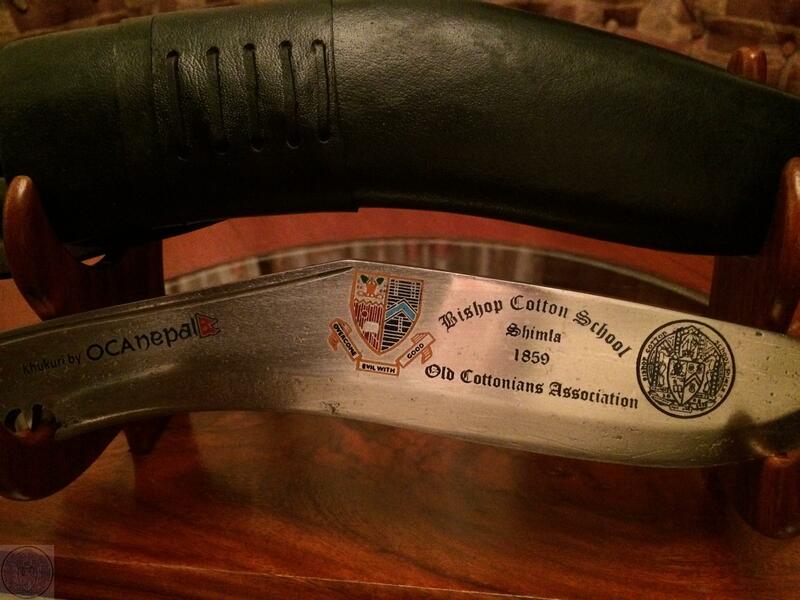 It’s a 10” blade, standard British Army size, usable and displayable KHUKURI with BCS and OCA emblems. It comes with a leather sheath and a wooden stand. Sent only 15 pcs for now as a trial run. It will be available, but may take time, AFTER OC Week 2016 as well. Priced at INR. 10,000/- only, out of which, INR. 3,000/- will be go to school and the remaining will go to the merchandise’s cost and OCA Nepal fund. And thanks to Saurabh Ranamagar, Abhinav Adhikari and Himmat Lal Shrestha, of UVI Batch of 2005, for carrying the merchandise to school. All the best for OC Week! This entry was posted in Events, Post and tagged 2016, BCS, Fund raising, OC Week, OCA Nepal on September 28, 2016 by admin. • High Tea in the Headmaster’s Lodge Side lawn / school dining hall; Subject to weather conditions and the number of OC’s present. • Special Chapel Service in the Holy Trinity Chapel for the batch of 1966 & 1991, Main School boys and Old Cottonian’s Staff Main Scholl & Junior School. • Lunch ( Main School Dining Hall); Batch of 1966 & 1991, Staff, OC-Team, School Teams & Upper Sixth Form. • Headmaster’s Dinner for the batch of 1996, 1991, Old Cottonian’s, Staff-Academic & Administrative. • OCA Dinner :Special Invitees-Headmaster, Head Junior School, Senior Master, Second Master, Bursar, Admin Officer, House Masters-Curzon, Ibbetson, Lefroy, Rivaz. Venue would be intimated closer to the date. • Lunch at the Headmaster’s Lodge Side Lawn for the OC’s of the Batch of 1996, 1991 & Special Invitees); Others in the School Dining Hall. 1. To participate in the Rally: Col.NKS Brar (Retd.) at mikkibrar@yahoo.co.in or on 9780402999. 2. Hotel Accommodation in Shimla: Arun Sirkeck at arunsirkeck1965@gmail.com or on 9418044545. 3. To take part in the sporting events:Ashwini Wirk at ashvirk@hotmail.com or on 9810194724. This entry was posted in Events, News, Post and tagged 2016, BCS, event, OC Week on August 12, 2016 by admin. How quickly our Annual OCA(UK) lunch seems to come around. I must really be getting older – certainly our younger members resemble more my grandchildren. However, there are still some tough old birds about – like Lance Jones in his ninety second year and still rooting for Arsenal – and that takes some loyalty. I was in Delhi on St. Valentines’ Day at the OCA(India) gathering with some 200 other OCs and their wives. A beautiful sunny day in the magnificent grounds of Deep C. Anand’s office HQ. All the House flags were raised and Dark and Light blue cotton screens surrounded the white, table-cloth covered tables and the serving tables, heaving with dishes from all parts of India and of course, the extra busy table laden with drinks. Chairman Sukhi Singh valiantly tried to say a few words above the never-ceasing chatter which was only silenced with our Chairman got hold of the microphone and demanded quiet in order that the brief speeches could be heard. Of course OCA(India) also had its old and respected ninety-year old General Bhatria present – looking in fine form. I was kindly presented with a model of the School building which our Chairman was able to bring back to the UK. There were quite a number of young OCs, but sadly the Headmaster was unable to be there as he had to be at the School to invigilate the last year exams there. Meanwhile back at in the UK, our Chairman, Kuljinder Bahia, was being presented with the Asian Business of the Year 2016 Award as C.E.O. of Southall Travel, by Mrs Priti Patel, Employment Minister, at the prestigious Asian Awards Dinner. During the ceremony the Asian Rich List was also announced and Kuljinder was named 19th Richest Asian in UK. Our Chairman continues to expand his Company and their destinations but never forgets his duties to the OCA and his old school. He is now getting the Pupil and Masters Exchange Programme underway and investing in the School at the same time. We hope that once more there will be a good turnout at our annual luncheon which is to be held on Saturday 25th June (11am onwards) at the Bombay Brasserie, Courtfield Road, London SW7 4QH. With best wishes to you and your families. I am so glad that I could make it for the Old Cottonians 1989 batch Silver Jubilee celebrations in Shimla, 18th – 20th September 2015. I would like to share my experience with you so I have written this short article. Firstly, I along with my batch mates are ever so grateful and indebted to our respected Headmaster, Mr Robinson who opened the School gates and hosted us for three days. We very much appreciate that our reunion was during a busy period in the School Calendar. My batch mates and I would also like to thank Mr & Mrs Robinson for all their hospitality. A very special thank you to all the Teachers, Administrative Staff, non-teaching Staff and also to all the young Cottonians who made our experience such a memorable one. As soon as Kuljinder Bahia and I landed at Chandigarh airport on 16th September, we were greeted at the airport exit by Kamal Kishore. Although this greeting was meant to be a brief one, we had Kamal Kishore travelling with us to Shimla and his boxing skills from our School days could not defend or match Kuljinder’s persuasive skills. In the next 24 hours, there were lots of phone calls finding out where our batch mates were, who is travelling with whom, have they left Chandigarh, what time will everyone be in Shimla etc. – the excitement was building up as some of us, for one reason or another, had not met since passing out of School. On the 17thSeptember, Sam Grewal was speeding up to Shimla with Amit Bakshi, Sukhtep Arora and Ankur Rohtagi in one car followed by many others. By about 8pm on the 17th, we were under one roof – at The Marina Hotel. The first day (18th September) of our visit to School kick started with a very touching and a heart-warming chapel service. The Headmaster in his speech confirmed that Kuljinder Bahia has donated 50 lakh rupees to the School and that these funds are held in the School’s Bank Account. From the Chapel we headed to the main Dining Hall for tea and a game of football which was of course won by the young Cottonians. Although we were beaten, some of us bruised by falls, and admittedly followed by days of muscle and joint aches and pains, it was nonetheless the spirit of the game and the participation which we enjoyed. Seeing some familiar faces on the first flat after the game, namely Mr Robin Sinha and Mrs Kaul bought back some lovely memories. I hope that the interaction session between the 1989 batch and the Upper Sixth Form was productive for the budding Cottonians who will very shortly leap into a very competitive world. Ideas about business, professions, academic routes, self-development etc. were raised. General aspects of life in School, the Cottonian brotherhood, inculcating discipline and English speaking within the campus were also touched upon. Visits to Chelsea, St Bede’s College, Auckland House, town leave etc. did not go amiss. Mr and Mrs Robinson opened the doors of the Headmaster’s Lodge for us for some enjoyable drinks (as a student, a visit to the Headmaster’s Officer or Lodge meant some serious and deep trouble!) followed by Headmaster’s Dinner in the Irwin Hall. The whole day was full of activities, interaction and was thoroughly exciting. Although we had a very long and tiring first day, we kept to our punctual timing and were on the first floor flat at 10am on the 18th September. Our match with the School XI cricket team started at 10.30, winning the toss we elected to bat first. The game which was witnessed by the whole School, Teaching and Administrative Staff did go in favour of the School team. Nitin Arora bowled very well and I could hear the cheering from the Cottonians, which included the shouts of “c’mon He-Man” (being Nitin’s school name). These cheers were probably instigated by the bubbly and jovial Abhinav Sikka (a keen tennis player from Kullu) and Inderpal Singh Dhillon. Rakesh Thakur badly injured his finger. Many catches were dropped by us, including one by yours truly. All the action was caught by Amit Bakshi on his camera. Lunch on the second day was also in the main Dining Hall. It was delicious! There was then a brief stopover at Mr Bhardwaj’s office where we verified our ICSE marks as there was some banter about some students claiming more marks than what they had achieved, flicked through The Cottonian, general gup-shup. We had a few hours to kill post lunch, so most of us headed back to our nests. The masseur at Hotel Marina had a rather profitable day, given that by this time everyone was queuing for his service. Late afternoon, we witnessed a very competitive and enjoyable Inter-House Hindi Play Competition – a great job by all the students who participated, the organisers and the House Masters. At the request of the Upper Sixth Form boys, Kuljinder Bahia approached the Headmaster for town leave. This was immediately granted, so a good result for the boys. Another sumptuous dinner was laid for us in the main Dining Hall. Day three (20th September) began with a Campus Tour. The Junior School has since 1989 been completely transformed. It was so nice to see Mrs Modi still active in her duties. Immediately after the Campus Tour, Kuljinder very generously donated an additional 10 lakh rupees for the development of Lefroy House cubicles! We enjoyed another lunch in School, this time with all the main school boys. We hosted a dinner at Hotel Marina for the Headmaster, Head of Junior School, Senior Master, Second Master, Bursar, Administrative Officer, House Masters and all the teaching staff. By the time we started, the Shimla weather turned for good from a light drizzle to a dry one (although slightly cold). It was an honour for us that the such a large number of invitees attended. The Headmaster distributed souvenir plates, which had been sent all the way from Delhi by the OCA Delhi Chapter. Kuljinder Bahia’s action of gifting 60 lakh rupees to the School is praise worthy. It takes a huge heart to make such a generous gift, irrespective of how successful one is in his business or stable in his financial affairs. I hope that Kuljinder Bahia continues to contribute to his Alma Mater not only financially but also with his experience as successful entrepreneur. He is also liaising with the Marlborough College regarding an exchange programme for students and teachers, and we all hope that it materialises. I take this opportunity to thank Mr Vijay Bhardwaj for many things, which include his dedication to the School and its past and present student’s, for always motivating and showing his students the correct and righteous path and for his politeness and humbleness. I have liaised with Mr Bhardwaj over the last 12 months or so trying to organise dates etc. for the reunion and as always I am grateful for the time he has given me, his guidance and support. Thank you to Mr Dhaliwal, Mr Dinesh Thakur, Mr Danny Singh and Mr Gurprit Singh for their unbiased umpiring! A big cheer and thank you to Mr Praveen Dharma for his time and effort in co-ordinating and supervising all the activities. Kuljinder, Dhiraj Sardana and I left Shimla early morning on the 21st September. Never shall I forget the memories attached to my batch reunion. Still kindled and strong are those friendships and bonds – which will never die. I carried along the School Service book which I read regularly. Before I conclude, I must thank those batch mates who made it to the reunion, including the day scholars and for all those OC’s who contributed towards the dinner hosted at the Marina Hotel. Sukhtep Singh, Pronthep (Pawanjeet) Singh and Umesh Pandey came all the way from Thailand, so the OCA Thailand Chapter survives! I look forward to meeting all of you again, hopefully for the OCA (UK) reunion on 25 June 2016 in London. This entry was posted in Events, News, Post and tagged 2016, Get together, Networking OCs, News Letter, OCA UK on May 6, 2016 by admin.